I recently had the opportunity to try a delicious juice from Tropicana. Tropicana Essentials® Probiotics is a 100% juice with probiotics and no added sugar or artificial flavors. It’s made with the goodness of Tropicana fruit and combines nutritious ingredients with the benefits of probiotics. I love that you can make healthy choices with the convenience of shopping in the juice aisle at your nearest Wal-Mart. Add a glass of Tropicana Essentials® Probiotics to your morning routine and begin to feel the benefits within a matter of days. It’s a convenient and healthy choice for kids and adults. Pair a glass with a balanced breakfast for a delicious combination. Every eight-ounce serving of Tropicana Essentials® Probiotics delivers one billion live and active cultures to your gut. Plus, each serving provides your whole day’s vitamin C along with other vital nutrients! Research has been promising and shows that the potential benefits of probiotics are pretty impressive. While no health claims are guaranteed, probiotics have shown a lot of promise in helping people deal with or prevent a variety of conditions. 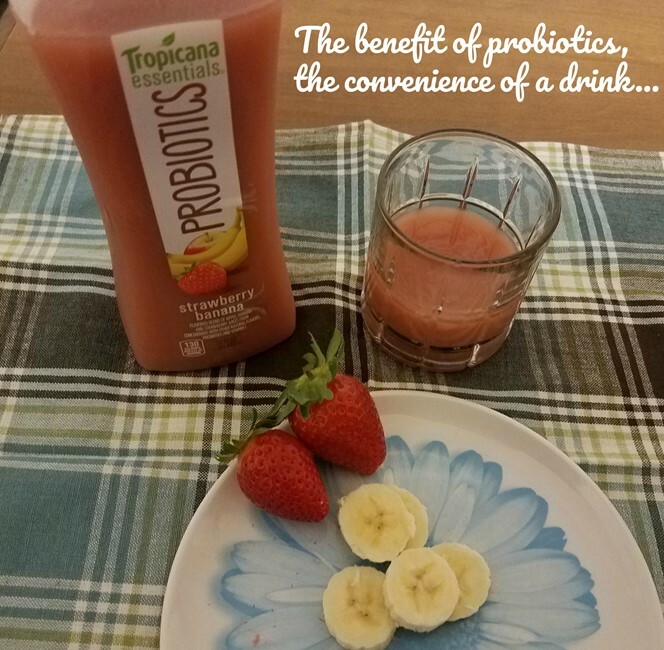 Tropicana Essentials® Probiotics is a delicious, accessible, nutritious and convenient way for consumers to get more probiotics into their daily routines. We found the 32 oz bottles in the refrigerated juice aisle at our local Wal-Mart. It was available in three delicious flavors – Strawberry Banana, Pineapple Mango and Peach Passion Fruit – and is sure to delight! We tried all 3 flavors and the strawberry/banana is our favorite but the other 2 are great as well. They are all satisfying and delicious and slightly reminiscent of a smoothie drink. It wasn’t overly sweet, and had no after taste. I really liked that this juice has probiotics in it to help ensure that my kids and I are in optimal health by drinking a glass of it every day. There are so many things to love about this juice that we’ve made it an essential part of our daily routine! The easy pour bottle is now a fixture in my fridge. Pick some up at your local Wal-Mart today.